I hope everyone got what they wanted for Christmas! I had a beautiful day with my family and opened gifts as we watched the Disney Christmas Parade on TV! What's funny is that parts of it were filmed in early November....we know this because we were there to see the filming of it with the Backstreet Boys! It was a warm Sunday (80's) in Anaheim and those poor boys were wearing their winter clothes! The boys ended up doing about 5 takes, the last two had the snow and fireworks! 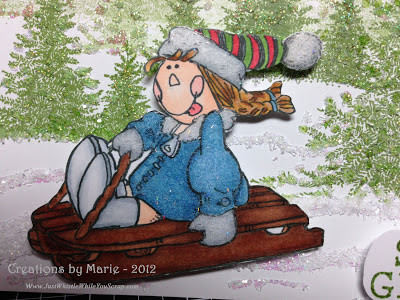 It's that time again for Cards by Lady Anne's Friday Sentiment Challenge! This month our Sponsor is QKR Stampede. They have the nicest digis for coloring with just about any medium. 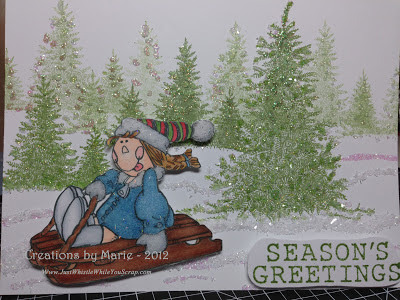 Below is a winter card I made using a QKR Stampede digital stamp. I colored the image using Copics and also used Heartfelt Creations Christmas trees for the background. I stamped off the page to get the three dimensional look of the trees and then used two kinds of glitter and broken glass for the snow. For the little girl's hat and dress, I used light blue and white glittered flock over the Copics. I love the texture that it gives and it feels so soft! I hope you enjoy! Well, it's Christmas Eve. I don't know about you, but this year flew by faster than any other year. Isn't it funny that the older we get, the faster time flies. I wish everyone a very happy Christmas and prosperous New Year's 2013. Now that I have mailed out my Christmas cards I can post them here. The picture really does give it justice as they look so much prettier in person. 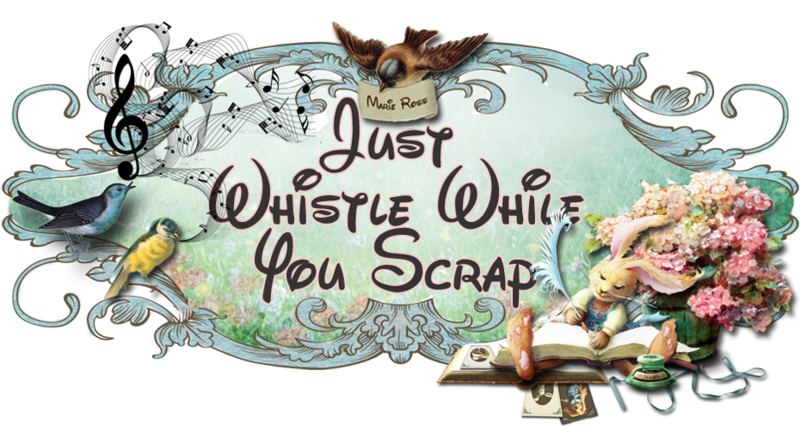 I used a 6x6 embossing folder (a damask-look design) for the background. I then cut a piece of cardstock 2 inches wide and then by the length of the background paper. 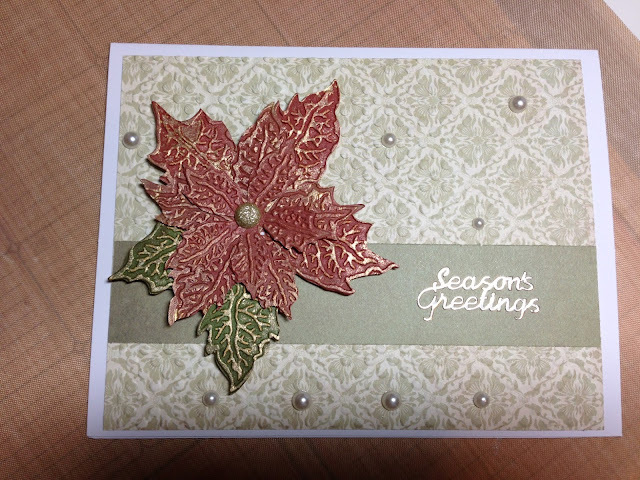 Using the Tim Holtz Poinsettia steel rule die, I cut out the three poinsettia flowers and embossed them on the Tim Holtz poinsettia matching embossing folder. On the large flower, I used Distress Ink in Moss Green to do two "leaves". I then used Barn Door Red for the remainder of the petals. Once I embossed, I used Brilliance Dew Drop Ink Pad in Gold to smoothly go over the embossed raised edges of all the petals. I arraganged the leaves and pinned them together with gold-glittered brad and mounted them with 3-D mounting tape. I took different sizes of cream-colored pearls and arranged them in the background. The greeting was done with Peel Off stickers. The petals can be easily bent and folded to your heart's content. A very elegant card for a very special holiday. We celebrate both Christmas and Hannukah in our household and I had posted some of the Hannukah cards I made for friends but did not post the one I made for family. Why? Because I had forgotten to take a picture of it! My mother-in-law had it on display at her house so I finally was able to take a picture of it! (see below). 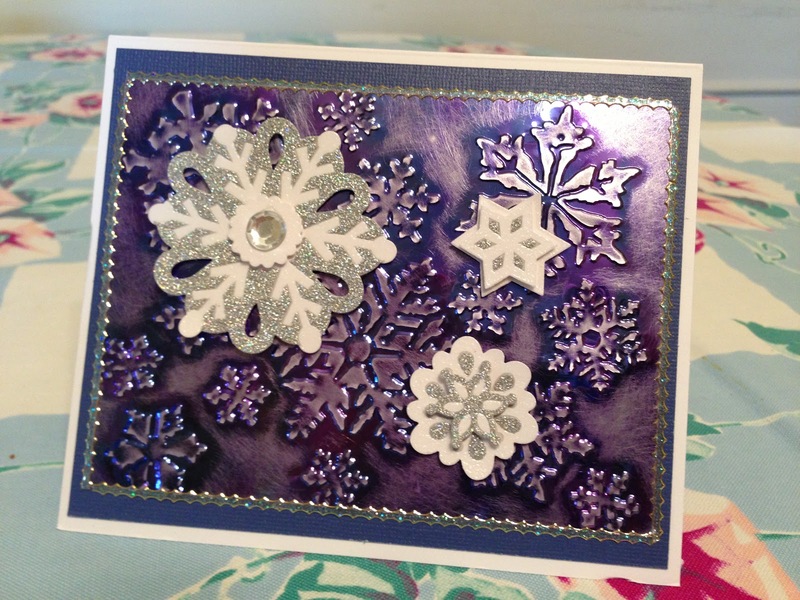 I used the Blue Shimmer Sheet from Elizabeth Craft Designs and embossed it with a Sizzix snowflake embossing folder. I then used an abrasive file and took as much "shimmer" off the raised design as I possibly could. I used Elizabeth Craft Design Peel Offs around the entire shimmer sheet. I then put some EK Success snowflakes that I had found at my local Michael's. This card can be used for both Hannukah and Christmas with just a small color change. I hope you enjoy both of these designs and look forward to sharing very many more with you in the coming year. Hugs to all!